The number one topic our clients ask about is search-engine optimization (SEO). Everyone seems to be talking about SEO, but many people fail to understand the strategy behind bringing ideal customers to their website. Often times clients hope to just throw money at the situation with AdWords and the like. While these tools can be very useful and helpful, it is still critical that there be a clear plan and strategy in place for SEO. Our approach to effective SEO is focusing on our client's audience. The audience influences everything from branding to content and navigation. While this strategy might seem obvious, you'd be surprised how often it's overlooked. Put yourself in your customers' shoes. If you're looking for a company or service, what would you type into Google? To ensure your site is appearing on the right list of results, you must first know what your audience is looking for and what they are hoping to find. Google Analytics is a hugely useful tool for analyzing the search terms that are bringing users to your site. Use this data as a jumping-off point. The terms used in your navigation are crucial to SEO. Google loves crawling a site's navigation and sitemap to see what keywords are important enough to be on the forefront of your site. Use terminology that makes immediate sense to your audience--they can't search for something they don't know. Think of your site pages as the outline of a term paper. The title of each page should give your customer an idea of what the page will cover. From there, any subtitles and paragraphs should fit perfectly under that main title. This hierarchy will also be helpful as Google crawls your site. Titles throughout a site will also hold weights for organic search. Once you have your search terms in mind, dive deeper into what your audience is hoping to find on your site. The content you're providing should actually answer their most important questions while telling the story of your brand. Customers have short attention spans. When they encounter irrelevant and confusing content, they'll move on to a competitor's site. 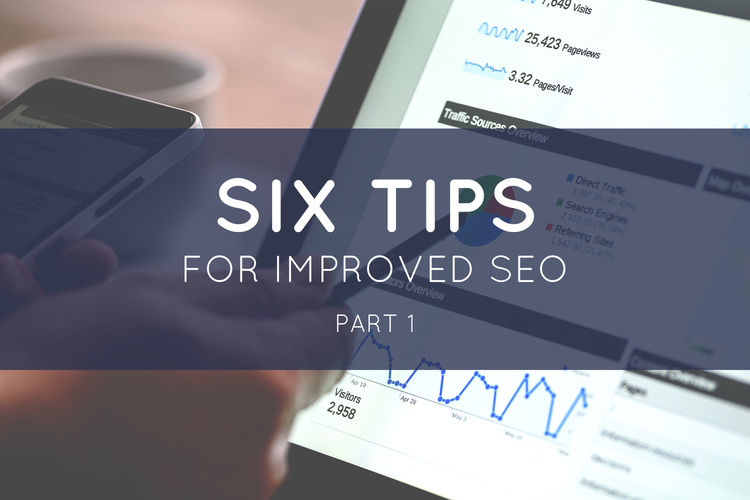 This can also have lasting effects on the SEO of your site, as Google keeps track of how quickly visitors "bounce" off your site and counts this against you. While keeping your content as relevant and concise as possible, be sure to sprinkle important keywords throughout the information. This ensures that as Google crawls through your site, it sees that these keywords are part of what you offer. For example, I want potential clients to find WebVolta when they search for branding services. To ensure the keyword branding appears throughout our website, we list branding as a service, write blog posts about the branding process, and list branding as a component of my personal skillset. We use the same methodology for our developers. Nic and JD are experienced Ruby developers, so we make a point of blogging about Ruby topics and including relevant keywords in those posts. If writing regular articles or blog posts seems overwhelming, I would highly recommend including social media feeds on your site. Google will recognize this content churn and will take notice of the regularly updated and relevant information on your site just like it would a blog post. Twitter and Instagram can be especially helpful. Let's say you make jewelry and sell it at craft fairs. Take pictures of your booth and write a comment about offering handcrafted jewelry at Craft Fair 2017. The more you share topics like this in social media that post to your site as well, the more likely you are to appear in a search based on it. Don't forget the hashtags! This has been a quick introduction into SEO from a branding and content perspective. Next week, Nic will share Part 2 on SEO from a developer standpoint. Looking for help with SEO? We’d love to work with you. Contact us to set up a consultation!